Weekly Photo Challenge: Threshold | Oh, the Places We See . . .
← Discovering Boise: Six places to eat you won’t find back home! A threshold can be symbolic of the beginning of a new venture. Or a threshold can be a doorway through which one can pass. 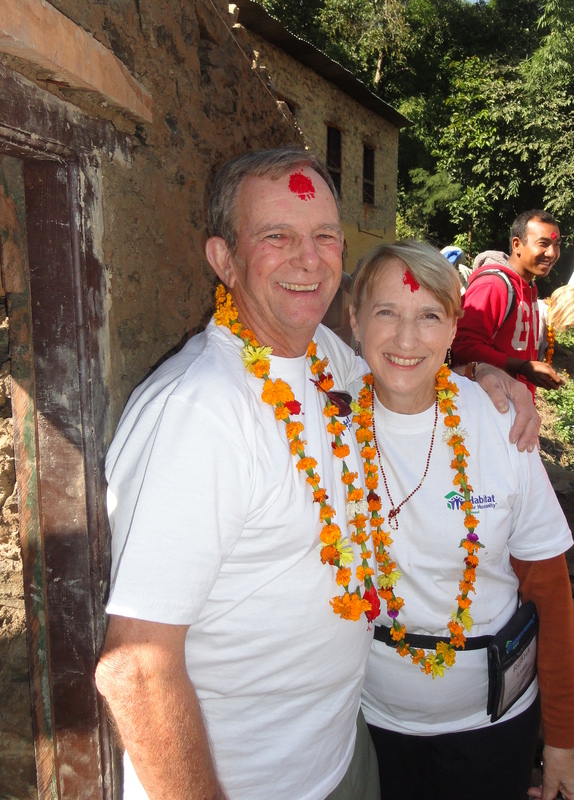 This week’s Weekly Photo Challenge: Threshold brought to mind three images from our trip to Nepal where building a Habitat for Humanity house became the threshold of a new life for one family and an unforgettable adventure for us. First, as tourists in Bhaktapur, we snapped this early-morning photo of a woman standing on the threshold of her home, broom in hand, preparing for Sunday visitors who might pass through her village. Second, when we arrived two days later at the site of the Habitat build, two women next to our vacant lot stood upon the threshold of their brother’s house — watching and waiting — anxious to see what we were all about. Finally, when our two weeks of work ended, we stood at the threshold of the home we had built — adorned with celebratory strings of marigolds and touches of red on our foreheads thinking of the future for the family who would live here. For more expressions of Threshold, click here. This entry was posted in Nepal, Travel, Weekly Photo Challenge and tagged Bhaktapur, Habitat for Humanity, Nepal, postaday, threshold. Bookmark the permalink. Great post Rusha! Habitat for Humanity is such a wonderful organization. How rewarding it must be to volunteer in such areas of the world. Thanks so much. We have such fond memories! Thanks so much. It was an absolutely wonderful experience! Thanks so much! I’ve enjoyed looking at your blog. How does a Mom of nine children have any time to write or read? Wow! You are amazing! Haha. Less facebook time. 🙂 It’s a creative outlet for me that my husband and kids support. Thanks for your kind words. I looked around your blog too and I am amazed at your adventures! My husband and I hope to travel when he (someday) retires. Marigolds always make me think of Nepal. Blessings to you and Bert. I couldn’t help but smile after I loaded these pictures into the blog. And I had just spent about half an hour going through other pics and reliving memories! So glad we went. So glad you were with us. Join us in Africa in August! It was a wonderful effort with 13 other people. We all got more out of it than we put into it! Thanks for reading.